David Moyes kicked off his Spanish managerial career by guiding Real Sociedad to a 0-0 draw at struggling Deportivo La Coruna on Saturday night. Although the game itself was unremarkable, especially during a flat second half, it was still a highly eventful debut day for the former Preston, Everton and Manchester United boss, featuring a diverted aeroplane, a series of selection decisions, a bizarre touchline bust-up and a midnight finish. Spanish media coverage of La Real's trip to Deportivo was utterly dwarfed by none other than Lionel Messi, who just happened to break the all-time La Liga goalscoring record roughly half an hour before Moyes's debut got under way. In Moyes's first game, Real Sociedad kept a clean sheet for the first time since April. National interest was further minimised by the additional considerations that league leaders Real Madrid and reigning champions Atletico Madrid had already played earlier in the day, along with the fact that the game had been given the dreaded 'graveyard shift' 22:00 kick-off slot. Indeed, the fixture's lack of prestige was laid painfully bare by the fact that although it was the only fixture of the weekend made available for free-to-air television viewing, national broadcasters Cuatro elected to shunt the game to an obscure lesser station and reserve their main channel for an airing of animated children's movie Madagascar 3. An early lesson about life in Spain, then, for David Moyes: whatever you do, everyone will still be talking about Lionel Messi. The Scot's preparations for his La Liga bow took an unexpected turn when bad weather re-routed the team's flight to A Coruna to nearby Santiago De Compostela, the famous Catholic pilgrimage site (is that an omen?). 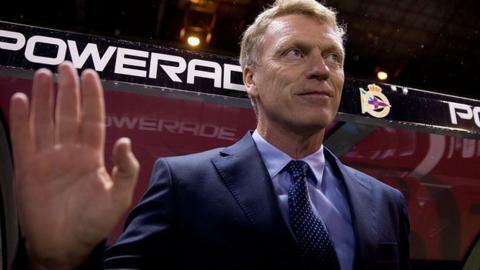 After finally making their way to Deportivo's Riazor stadium, Moyes was able to name his first Real Sociedad team - and there were more changes that he had wished to make because of a series of injuries. In particular, Moyes was forced to field a makeshift central defensive partnership of Ion Ansotegi and Gorka Elustondo in the absence of regular starters Inigo Martinez and Mikel Gonzalez. Another big decision concerned the identity of his goalkeeper, with Enaut Zubikarai failing to impress since replacing Barcelona-bound Claudio Bravo at the start of the season and summer signing Geronimo Rulli pushing for a debut after recovering from injury. In the end, however, Moyes opted to retain faith with Zubikarai. One interesting selection was Sergio Canales, the former Real Madrid and Valencia midfielder whose talent has never been in doubt but who has frequently failed to deliver. He was picked on the right of midfield. Moyes also overturned the much-debated decision of predecessor Jagoba Arrasate to sideline popular right-back Carlos Martinez, handing the 28-year-old only his third start of the season and leaving Arrasate's preferred choice Joseba Zaldua on the bench. Moyes's team lined up in a 4-4-2 formation - a playing system rarely used in Spain - with former Arsenal striker Carlos Vela given license to roam alongside Imanol Agirretxe in attack. Heeding their new manager's pre-match call for intensity and pace, La Real looked to get the ball forward as quick as possible, especially into wide areas with the intention of delivering crosses into the box. Moyes reportedly spent lots of time rehearsing set-pieces with his new players ahead of the game, and there also appeared to be an emphasis on launching swift counter-attacks. "It is the right time. I am well rested and I am ready to go. I feel this job fits my character. It's been a big decision for me and my family." During the opening half, his team were well on top and came close to breaking the deadlock on a number of occasions, with Vela looking particularly menacing. But they faded badly in the second period, struggling to sustain any attacking pressure and forced to drop ever deeper as hosts Deportivo pushed for a valuable winner. Midway through the second period, Moyes made a tactical switch by withdrawing winger Chory Castro and introducing central midfielder Ruben Pardo, with Vela dropping wide in a 4-5-1 formation in an attempt to establish more control over possession. The plan did not work as Deportivo continued to look the more likely scorers, and Moyes was ultimately grateful to secure a point after goalkeeper Zubikarai justified his selection with a good late save from on-loan Real Madrid midfielder Jose Rodriguez. If Moyes needed a reminder about the tendency of the Spanish temperament to indulge in flamboyant emotional outbursts - quite different from the stoic Scots - he was provided with one just half an hour into his first game in the country. After Vela came close to scoring the opener with a speedy break, Deportivo assistant coach Roberto Cabellud exploded with fury on the touchline, approaching the visiting bench and directing his anger at Moyes, who reacted by standing on the edge of his technical area and producing the universal 'calm down' hand-pushing sign, with the effect that he appeared to be repeatedly patting an invisible large dog. The Scot looked perplexed as referee Eduardo Prieto sent the unruly Cabellud straight down the tunnel and, although the cause of the spectacular fit of rage was not immediately clear, reports soon circulated that the Deportivo coach was enraged because Moyes had supposedly stepped onto the pitch during Vela's run towards goal. Real Sociedad's performance - starting well but finishing poorly - was not a surprise to the club's fans, judging by their comments on social media. A lack of physical conditioning was one of the chief complaints directed against predecessor Arrasate, and although La Real supporters were clearly unhappy with the way their team faded, there was little in the way of dissent against the new manager. Instead, the tone was more realistic, with one fan quipping: "Moyes is going to pack up his suitcase again now," and another summing up the mood of disenchantment with the former regime by opining: "A year and a half of Jagoba [Arrasate] can't be fixed in a week." The same views were shared by leading sports newspaper Marca, whose match report carried the headline: "Moyes has a lot of work ahead of him," while El Pais billed the game as a "tepid debut for Moyes". And 'tepid' is perhaps the best word to describe an encounter which could have been a lot better but was by no means all bad for Real Sociedad. Despite having trained for little more than a week under their new manager, there was a clear gameplan and a commitment to fight for a point when the going got tough in the final stages - qualities which were not always been evident under Arrasate. And the biggest positive of all: it was their first clean sheet of the season. So there is plenty to build on, but much more will be expected by the time of Moyes's next big date: the local derby with Athletic Bilbao on Sunday, 14 December.